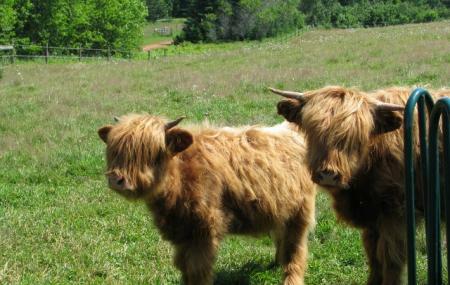 Island Hill Farm in PEI is an exciting place for animal lovers. A family owned, family friendly farm where happy animals and smiling owners welcome you with open arms. There are a number of activities for young adults and children even though just spending time with animals is a great pastime. You can choose between just cuddling the animals to milking goats and even learning about them from the very knowledgeable owners. Also you can see bunnies, hens, kittens and a mule here. The venue is also available for arranging events like birthday parties, summer camps, school tours, senior citizen’s groups, corporate team-building events, weddings. A great place for a picnic and spending time with family! Travel by cab or rent a car to reach this destination. How popular is Island Hill Farm? People normally club together Charlottetown Farmers Market and Ardgowan while planning their visit to Island Hill Farm. One of the best farms to visit in PEI! It's so much fun with the animals, the shoppe and the owner is incredibly kind! Staff are amazing and friendly! Love this place, it's so engaging and educational especially for kids! Excellent place to take the children/grandchildren, to see a variety of animals and roam among them and pet them. The animals are very used to children being around them - everyone can wander among the goats (of all ages); the last day that I had my granddaughter there, a very young goat thought that my leather purse looked good enough to ear, I had a little problem convincing it their food would be better for it, we spent a fair amount of time with "Lolly" the baby alpacca and momma, they also have laying hens, baby rabbits which the children can hold if they wish to, pigs, ducks/geese, and a donkey. An excellent way to pass a couple of hours with a child and never get the question "Are we leaving yet?" Love this place! Such a great spot to spend an afternoon hanging with goats, pigs, chickens, rabbits and alpacas. The little shop on site is delightful with a wide variety of goat soaps and other locally made products. Definitely worth a visit! Amazing place for kids and adults. Great staff and volunteers. Thanks for all the love! Special shout out to the amazing volunteers, Abby and Sydney. You ladies were thoughtful, caring, and showed your wisdom and enthusiasm. May you have long careers working with the animals you so clearly love. This place was so great! A group of friends and I went because we had a 2 year old in tow, but honestly, we had more fun than the toddler! You can meet, feed, pick up, and hold baby goats. They had alpacas, baby bunnies, ducklings, pigs. They make goats milk products and sell some other local PEI produced snacks! I would definitely recommend this place for children or adults, you can’t not enjoy!